World Sickle Cell Day occours yearly on 19th June to raise awareness of InteSickle-cell disease (SCD), or sickle-cell anaemia (SCA) or drepanocytosis. Sickle Cell disease is a hereditary group of blood disorders typically inherited from a person’s parents. It is characterized by red blood cells that assume an abnormal, rigid, sickleshape. This so called “Sickling” of the red blood cells decreases the cells’ flexibility and results in a risk of various complications. The sickling occurs because of a mutation in the haemoglobin gene. Individuals with one copy of the defunct gene display both normal and abnormal haemoglobin. This is an example of codominance. In 1994, in the US, the average life expectancy of persons with this condition was estimated to be 42 years in males and 48 years in females. The average life expectancy in the developed world is 40 to 60 years However, thanks to better management of the disease, some patients can now live into their 70s or beyond. The condition was first described in the medical literature by the American physician James B. Herrick in 1910. In 1949, the genetic transmission was determined by E. A. Beet and J. V. Neel. In 1954, the protective effect against malaria of sickle cell trait was described. Sickle-cell disease occurs more commonly among people whose ancestors lived in tropical and sub-tropical sub-saharan regions where malaria is or was common. Where malaria is common, carrying a single sickle-cell gene (sickle cell trait) confers a fitness. Specifically, humans with one of the two alleles of sickle-cell disease show less severe symptoms when infected with malaria. Sickle-cell anaemia is a form of sickle-cell disease in which there is homozygosity for themutation that causes HbS. Sickle-cell anaemia is also referred to as “HbSS”, “SS disease”, “haemoglobin S” or permutations of those names. It results in an abnormality in the oxygen-carrying protein haemoglobin found in red blood cells. This leads to a rigid, sickle-like shape under certain circumstances. In heterozygous people, that is, those who have only one sickle gene and one normal adult haemoglobin gene, the condition is referred to as “HbAS” or “sickle cell trait”. Other, rarer forms of sickle-cell disease arecompound heterozygous states in which the person has only one copy of the mutation that causes HbS and one copy of another abnormal haemoglobin allele. They include sickle-haemoglobin C disease (HbSC), sickle beta-plus-thalassaemia (HbS/β+) and sickle beta-zero-thalassaemia (HbS/β0). The term disease is applied because the inherited abnormality causes a pathological condition that can lead to death and severe complications. However Not all inherited variants of haemoglobin are detrimental, a concept known as genetic polymorphism. Problems in sickle cell disease typically begin around 5 to 6 months of age. A number of health problems may develop, such as attacks of pain (“sickle cell crisis”), anemia, swelling in the hands and feet, bacterial infections and stroke. Long-term pain may develop as people get older. The care of people with sickle cell disease may include infection prevention with vaccination and antibiotics, high fluid intake, folic acid supplementation and pain medication. Other measures may include blood transfusion and the medication hydroxycarbamide (hydroxyurea). A small percentage of people can be cured by a transplant of bone marrow cells. .
As of 2015, about 4.4 million people have sickle cell disease, while an additional 43 million have sickle cell trait.About 80% of sickle cell disease cases are believed to occur in Sub-Saharan Africa. It also occurs relatively frequently in parts of India, the Arabian Peninsula and among people of African origin living in other parts of the world. In 2015, it resulted in about 114,800 deaths. world Sauntering Day takes place annually on June 19. Sauntering is a verb to describe a style of walking, slowly, preferably with a joyful disposition. World Sauntering Day was proposed order to encourage people to slow down once in a while and take it easy, occasionally, smell the roses, enjoy life and appreciate the world around them instead of rushing through life. The exact year of its origin is unclear, but it is credited to have begun at the Grand Hotel (Mackinac Island) in Michigan during the 1970s. The Grand Hotel on Macinac Island is a historic hotel and coastal resort on Mackinac Island, Michigan, a small island located at the eastern end of the Straits of Mackinac within Lake Huron between the state’s Upper and Lower peninsulas. It was Constructed in the late 19th century, and The Grand Hotel has been visited by a number of famous visitors, including five U.S. presidents, Russian presidents Vladimir Putin and Dmitri Medvedev, inventor Thomas Edison, and author Mark Twain. The Grand Hotel is a member of Historic Hotels of America, the official program of the National Trust for Historic Preservation. Famous for being the Cheif Mechanical Engineer for the London North East Railway, Sir Nigel Gresley was, Born 19 June 1876 in Edinburgh. However he was raised in Netherseal, Derbyshire, a member of the cadet branch of a family long seated at Gresley, Derbyshire. After attending school in Sussex and at Marlborough College, Gresley served his apprenticeship at the Crewe works of the London and North Western Railway, afterwards becoming a pupil under John Aspinall at Horwich of the Lancashire and Yorkshire Railway (L&YR). After several minor appointments with the L&YR he was made Outdoor Assistant in the Carriage and Wagon Department in 1901; in 1902 he was appointed Assistant Works Manager at Newton Heath depot, and Works Manager the following year. This rapid rise in his career was maintained and, in 1904, he became Assistant Superintendent of the Carriage and Wagon Department of the L&YR. A year later, he moved to the Great Northern Railway (GNR) as Carriage and Wagon Superintendent. He succeeded Henry A. Ivatt as CME of the GNR on 1 October 1911. At the 1923 Grouping, he was appointed CME of the newly formed LNER (the post had originally been offered to the ageing John G. Robinson; Robinson declined and suggested the much younger Gresley). In 1936, Gresley was awarded an honorary DSc by Manchester University and a knighthood by King Edward VIII; also in that year he presided over the IMechE. Gresley designed a number of engines which were (and still are) considered elegant, both aesthetically and mechanically. His invention of a three-cylinder design with only two sets of Walschaerts valve gear, the Gresley conjugated valve gear, produced smooth running and power at lower cost than would have been achieved with a more conventional three sets of Walschaerts gear. During the 1930s, Sir Nigel Gresley lived at Salisbury Hall, near St. Albans in Hertfordshire. Gresley developed an interest in breeding wild birds and ducks in the moat; intriguingly, among the species were Mallard ducks. The Hall still exists today as a private residence and is adjacent to the de Havilland Aircraft Heritage Centre, with its links to the design of the famous Mosquito aircraft during World War II. In 1936, Gresley designed the 1,500V DC locomotives for the proposed electrification of theWoodhead Line between Manchester and Sheffield. The Second World War forced the postponement of the project, which was completed in the early 1950s. Sadly Gresley died after a short illness on 5 April 1941 and was buried in Netherseal, Derbyshire. 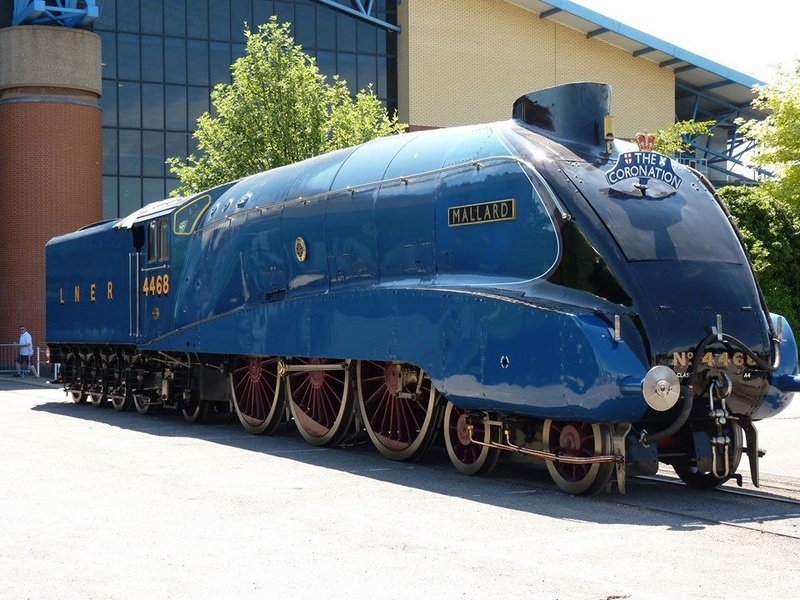 He is rmembered as on ofBritain’s most famous steam locomotive engineers, having designed some of the most iconic and famous steam locomotives in Britain, including the LNER Class A1 and LNER Class A4 4-6-2 Pacific engines. 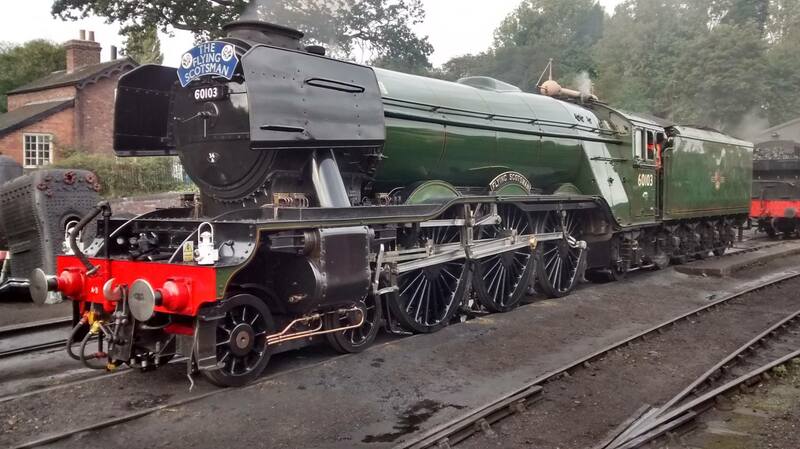 An A1, Flying Scotsman, was the first steam locomotive officially recorded over 100 mph in passenger service, and an A4, number 4468 Mallard, still holds the record for being the fastest steam locomotive in the world (126 mph). He was succeeded as the LNER Chief Mechanical Engineer by Edward Thompson. A statue commemorating Sir Nigel Gresley was unveiled at Kings Cross in London, complete with duck although the duck was removed as it was thought to poke fun at Gresley’s achievements and a new statue without the duck was unveiled 5 April 2016, however there was an outcry after the duck was removed and it has since been reinstated.